Process Details shows the process details. The dialog contains information about Module Details ( Version, File Version, etc. ), Process Details ( Exit Status, Affinity Mask, Base Prioriyty, Process Id, Parent Process Id ). Path and Command Line contain the executable file path and the command line string accordingly . 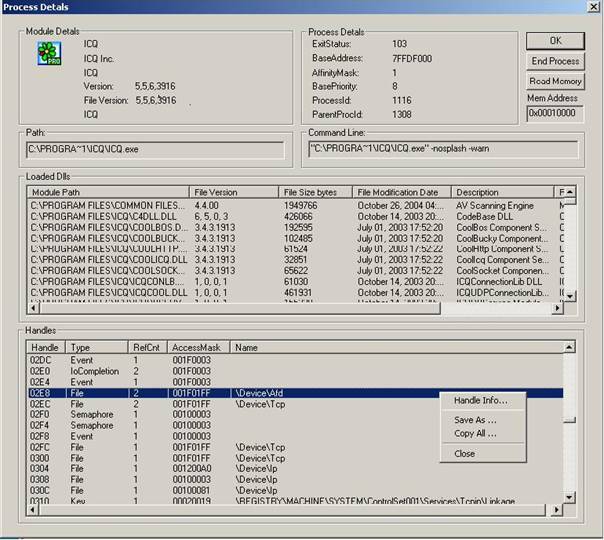 Loaded Dlls section contains information about loaded dlls , including Module Path, File Version, File Size, File Modification Date, Description, etc. Handles section contains handle information including Handle, Type, RefCount, AccessMask, Name. Handle Info – shows the selected handle information.